RTA Cabinet Construction | Buy Solid Wood RTA Kitchen Cabinets Today! Shaker Style Door Details: 5 Piece Doors and Drawer Headers. Door Hinges: 6 way adjustable Soft Close 1 1/4" hinge opens 110 degrees. Cabinet Face Frame: 1.5" solid hardwood face frames, dado-ed to receive 1/2" plywood case sides, tops (wall cabinets only), I-Beams (base cabinets only) and bottoms. Toe Board: 1/2" plywood toe kick board installed between cabinet end panels. 1/4" matching toe kick cover must be applied after installation. Interior: UV Sealed Natural Maple Finish. We do not use paper or plastic for our interiors. Our company does not use cheap Chinese methods for our cabinet assembly. We have noticed that almost all other RTA Cabinet stores online use cam-locks, metal clips or plastic L brackets for their assembly (We can best describe this assembly method is as if you were purchasing an entertainment center from a office supply store and had to screw it together with metal dials.) Using their Chinese method of assembly is not durable, unstable and can cause your cabinets to be racked (out of square) which is a major headache for installation. 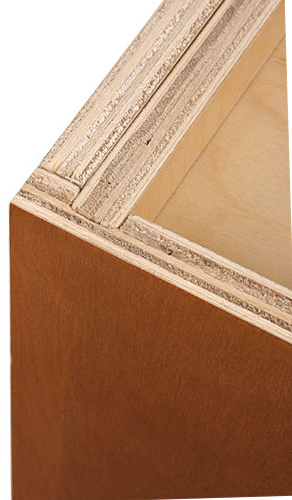 Our cabinets are made with a 1/2" plywood back, top, bottom & sides along with an additional 1/2" hanging rail to add extra support to your cabinet when it is attached to your wall. 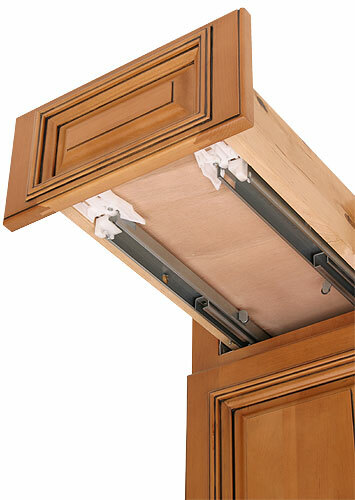 Our company uses I-Beam Construction which is used by custom cabinet companies here in the USA. We cut our plywood here in the USA to ensure quality and durability. Flat Pack unassembled orders are shipped so you can assemble the cabinets upon receipt. Order Your RTA Kitchen Cabinets Pre-Assembled: Online Cabinets Direct offers cabinet assembly for $50.00 per base/wall cabinet & $100.00 per Tall Oven/Utility Cabinet. 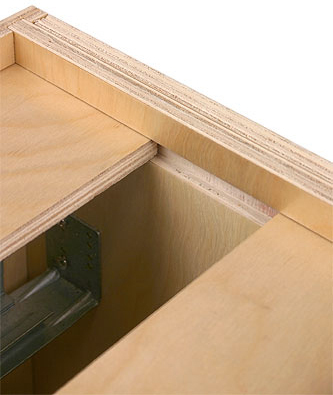 Our cabinets do not use camlocks, metal clips nor plastic corner brackets for assembly. 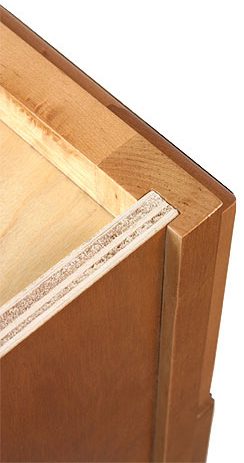 We use the same construction method as high end custom cabinet companies here in the USA. Online Cabinets Direct is a US base company and know the difference in cabinet quality. 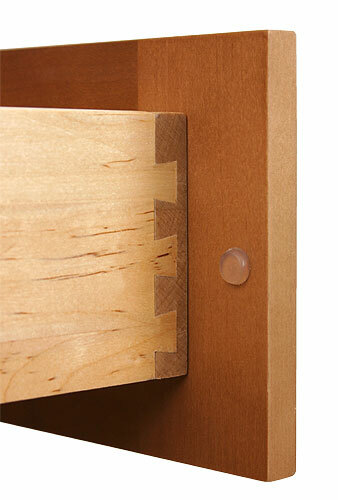 Our cabinets are not built to Chinese specifications like other online cabinet stores. We build our cabinets to USA standards to ensure they will last for many years to come because we are American and know quality is your main concern. 2. Apply Protection Layer (Cloth Sheet, Cotton Blanket, Etc.) To Avoid Scratching Face Frame, Doors And Drawer Headers. Base Cabinet I-Beam Stretcher Panels 4" x 22 5/8"
Vanity Cabinet I-Beam Stretcher Panel 4" x 19 5/8"
Base Cabinet Drawer Slide 21"
Vanity Cabinet Drawer Slide 18"
#18 Gauge Galvanized Brad Nails For Attaching Plywood Side Panels To Top Panel (Wall Cabinets & Tall Cabinets Only), Bottom Panel, Back Panel, I-Beam Stretcher Panels (Base Cabinets & Vanity Cabinets Only) and Toe Kick Backer Panel. We Recommend Building Cabinets With Exposed Sides (Sides That Are Seen Exposed To The Room After Installation) First, This Will Ensure You Will Have Replacement Parts From Other Cabinets If You Damage The Side Panels When Nailing or During Assembly.